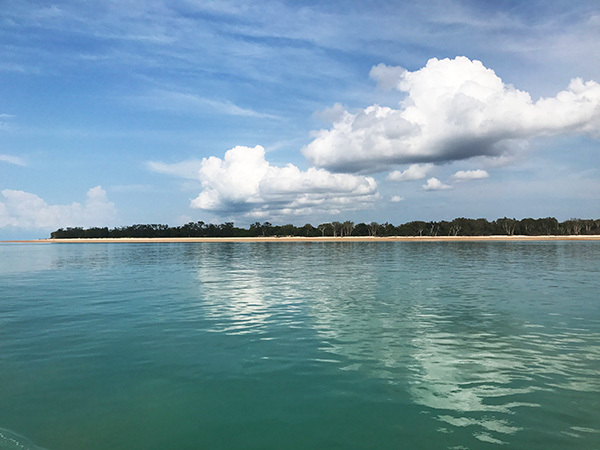 A visit to the Tiwi Islands is a must do if you are in Darwin. 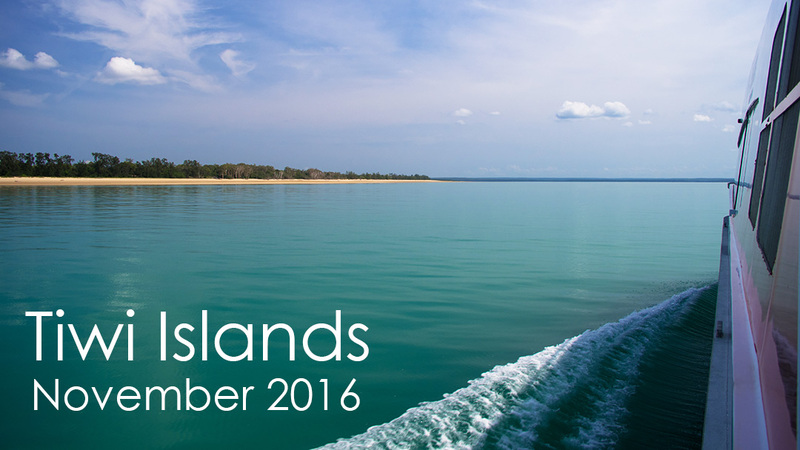 The islands, comprised of Bathurst and Melville islands, are located 80km north of Darwin and are accessible via a two hour ferry ride. Our full day tour was of Bathurst Island which is the most populated of the two islands whilst Melville is the second largest island in Australia – only Tasmania is larger. Arriving at Wurrumiyanga we joined our tour bus and headed to one of three art centres that operate on the island. 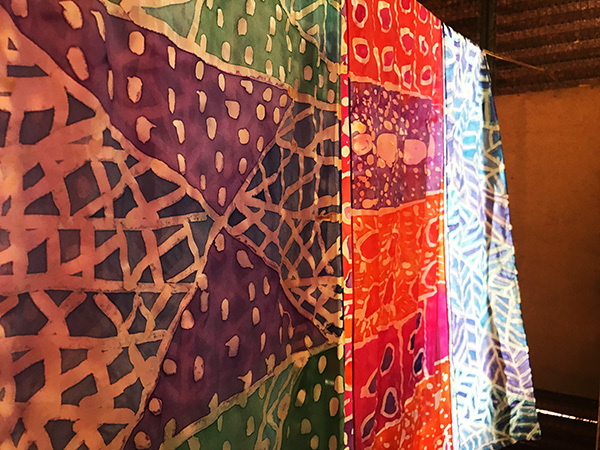 The Tiwi people are known internationally for an individual style of art including bright textile designs and carvings. 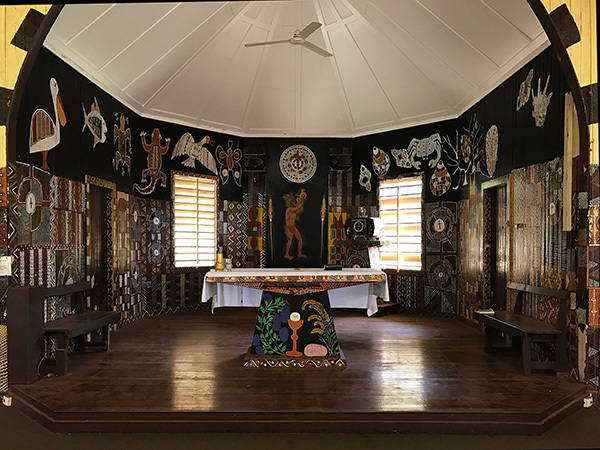 Prized by collectors, many Tiwi artists have exhibited around the world. 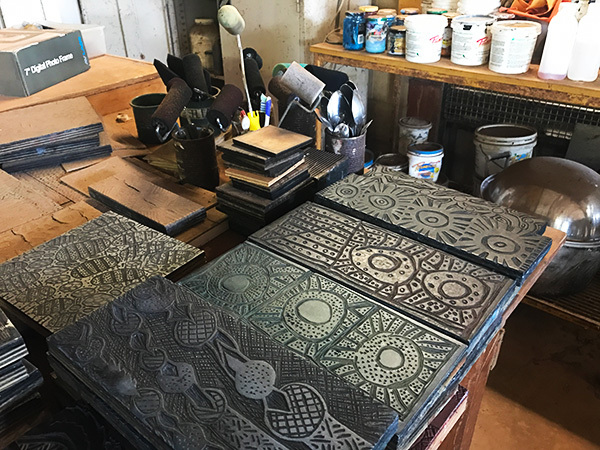 Our first art centre specialised in wood carvings with a number of local men on site to explain their work – wooden sculptures of local birds and animals which are then painted and sold. Initially shy, the artists are willing to engage in conversation and answer questions if prompted. 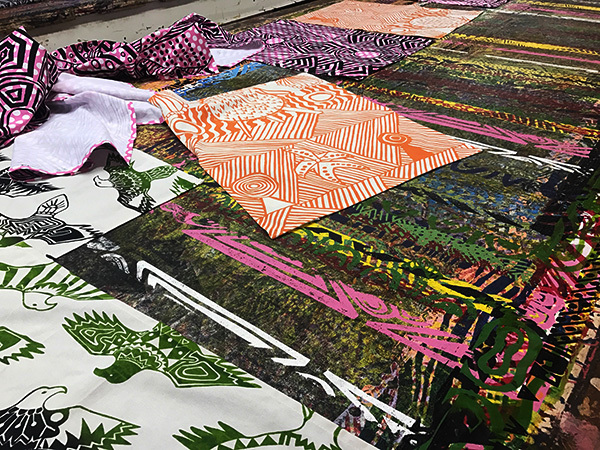 Our second stop was a screen printing workshop run by local women who printed their designs on tea towels and other fabric. 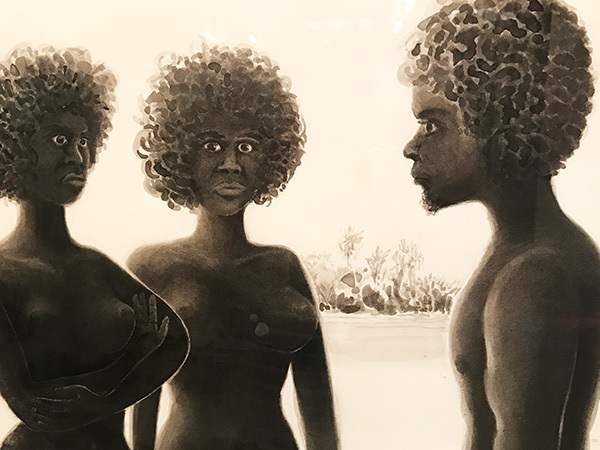 It became apparent quite quickly that whilst Aboriginal, their artwork and customs differed greatly from mainland Aborigines and the influence of the islands to the North of Australia such as Papua New Guinea and Timor is most evident. They do not use or make boomerangs or didgeridoos and being an island, the emphasis is on water and the surrounding sea. 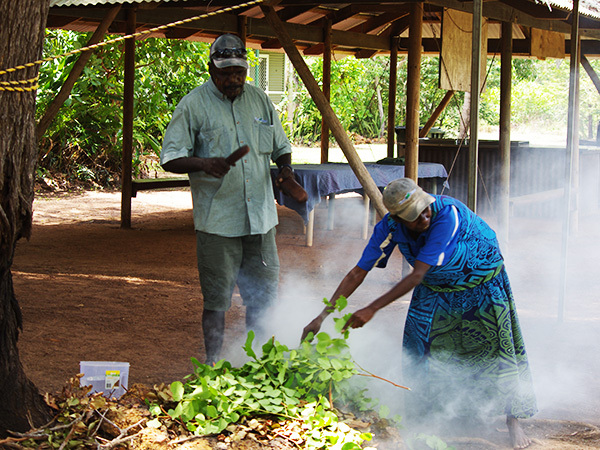 The Tiwi Islands are known as ‘the islands of smiles’ and this was evidenced particularly by our local guide and his family who we met for morning tea of damper and tea. Greeting us with big smiles, they laughed and joked the whole time we were with them. 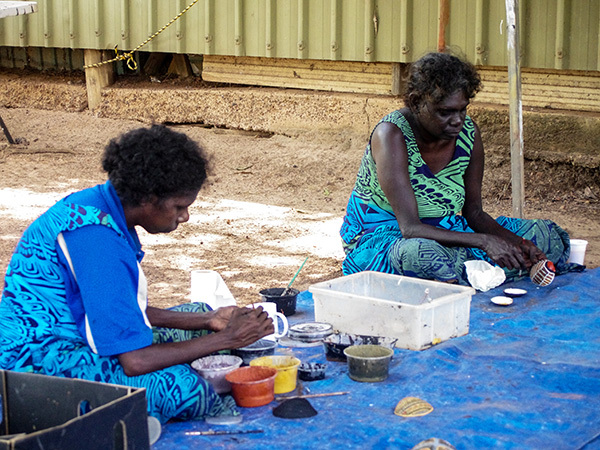 The women were painting intricate designs on sea shells and following morning tea, we participated in a welcome/smoking ceremony, involving dancing and singing as well as the infusion of smoke from gum leaves – very special. Family is very important to the Tiwi’s and our guide’s young son was included in the ceremony so that he could learn the traditional customs of his people. 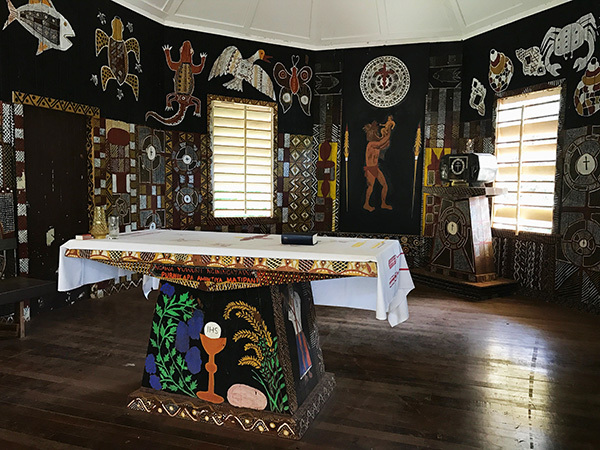 No visit to the islands is complete without spending considerable time exploring the extensive museum and learning about the Tiwi Island’s culture, language, spirituality and sporting heritage. 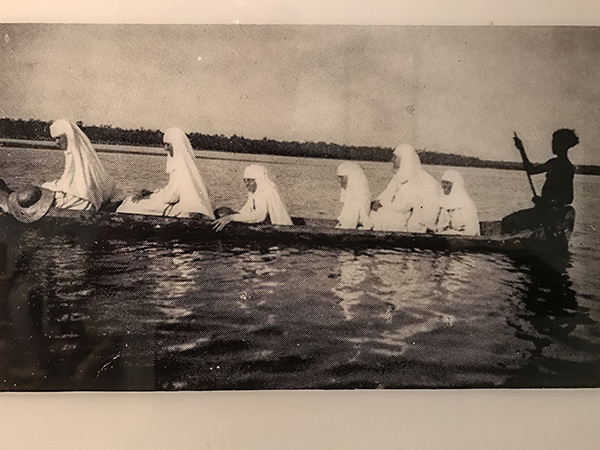 The role of the religious missionaries is also depicted with many photographs and artefacts. 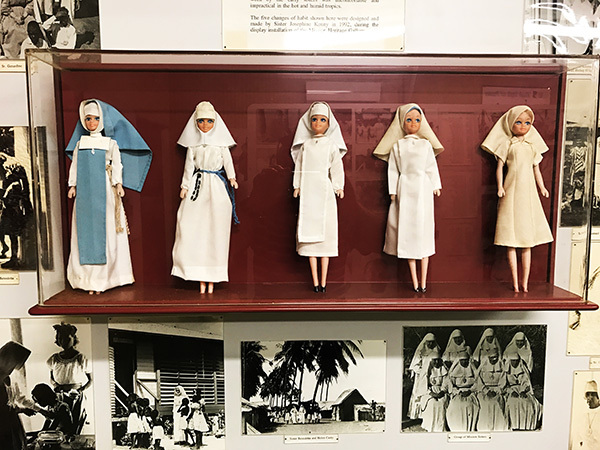 Sr Anne Gardiner has worked tirelessly for the Tiwi peoples since arriving as a teacher many years ago and she is largely responsible for the collection at the museum. In 2017 her work was recognised as she was awarded Senior Australian of the Year. Australian Rules Football (AFL) is in the blood of all Tiwi Islanders and their unique style of playing means they are a formidable opponent to mainland teams. 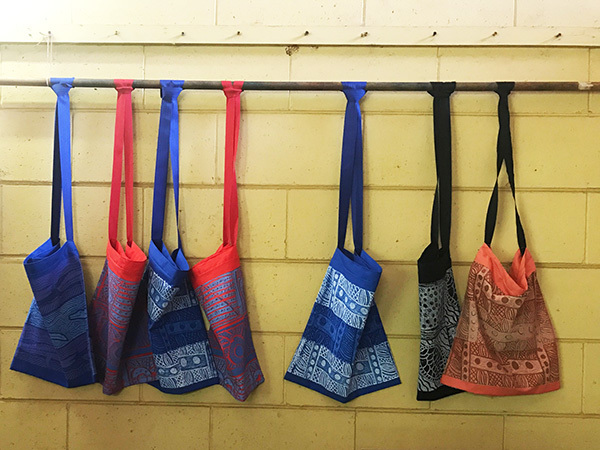 The Tiwi Islands have their own competition – The Tiwi Football League and with 900 participants from a total population of 2,600, it has the highest football participation rate in Australia. Our tour included a drive past the local AFL ground that comes alive on game day. 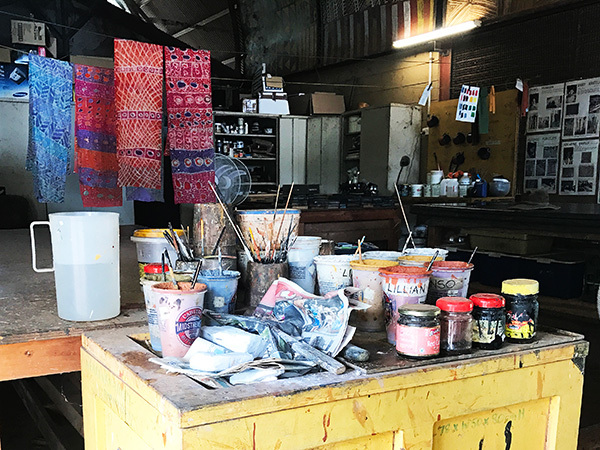 Tiwi Designs was the third art centre we visited on our tour and we watched as local residents learnt the process of silk screen printing. The designs tend to be geometrical in nature, often depicting birds and animals on huge lengths of material. When we first arrived on the island we noticed the local cemetery with its many Pukamani (poles). Our tour guide explained that unlike other Aborigines, the Tiwi Islanders used poles to denote the burial place of community members. The more significant the person, the more elaborate in design and decoration. Also, for 12 months following a death, that person’s name cannot be used as a sign of respect for the deceased. It was indeed a privilege to learn of these significant burial customs. 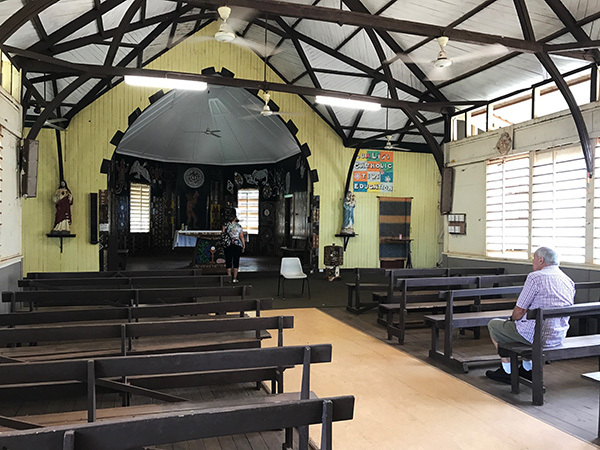 Our last stop on the tour was at the community precinct which included a number of historically significant buildings. The Catholic Church, looking like an old Queenslander type home from the outside was beautifully decorated inside with local artwork. The nearby radio station was used by one of the resident priests at the time to warn Darwin of the impending ‘Bombing of Darwin’, as depicted in the movie, Australia. The warnings went largely unheeded. The islands were also where the first Japanese prisoner of war was captured on Australian soil. Folklore says a local Aboriginal man, Matthias Ulungura, snuck up on the pilot, Toyoshima, whose plane had been shot down and stuck the handle of a tomahawk in his back, resulting in Toyoshima’s surrender and arrest. Interestingly, Toyoshima was a key instigator in the Cowra Breakout where he was moved to following his arrest. A statue of Matthias Ulungura has recently been erected near the church. 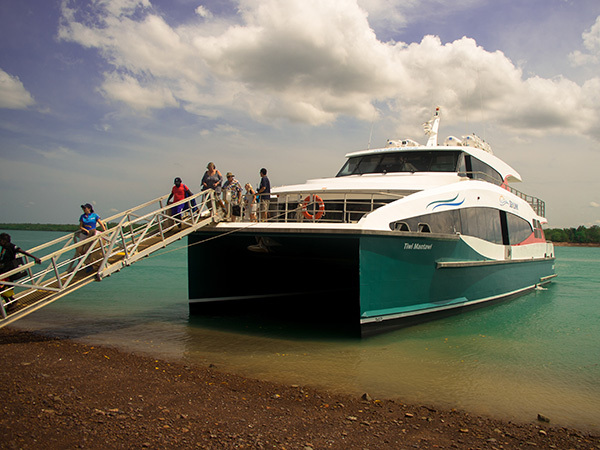 Our tour was complete and we returned to the jetty to catch the ferry back to Darwin with many memories of a fantastic tour, both culturally and artistically. As Australians, our indigenous culture is very rich and diverse and this tour allowed us a glimpse into a wonderful community.